Mrs. Yollis' Classroom Blog: Mr. Yollis Shares About Kodiak Grizzly Bears! 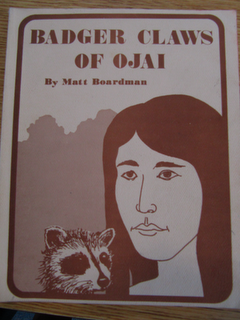 Mrs. Yollis' class has been reading Badger Claws of Ojai, the story of a Chumash Indian boy. In the story, the Chumash boy encounters a grizzly bear named Old Silver Tip. To complement the story, Mr. Yollis came in to share about his experiences with a sub-species of grizzly called Kodiak grizzly bears. Even Beverly enjoyed learning about her relatives! Kodiak Island is the largest island in the Kodiak Archipelago, and it is the second largest island in the United States. Here are some photo from Kodiak Island. 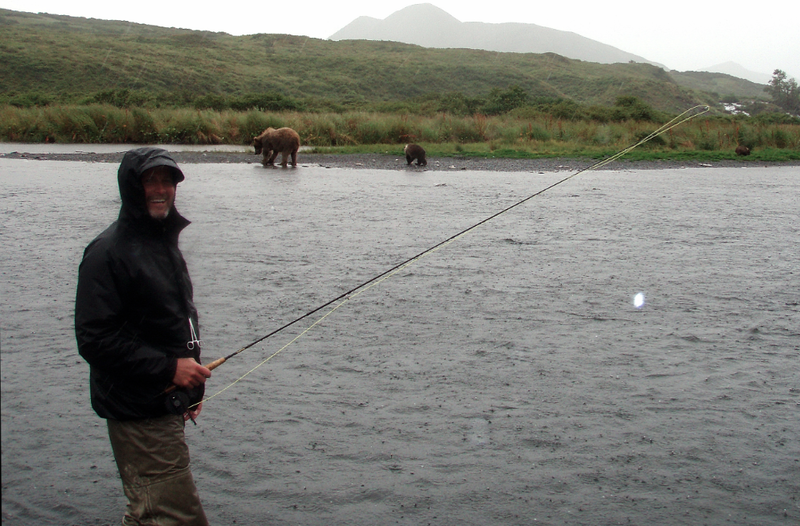 The bears and Mr. Yollis were there to fish for salmon! Notice the salmon trying to get up the falls to the lake where they can spawn. Grizzly bears have a large hump above their shoulders. The males, called boars, can weigh up to 1400 pounds. Females, called sows, range in weight from 500-700 pounds. Above is a photo of One Ear. She had three baby cubs. Above is One Ear and two of her cubs. Her babies watch her and learn how to catch salmon. Lots of flora and fauna can be found in Alaska! That's a fancy way of saying there are lots of plants and animals in Alaska. Above Mr. Yollis tries to compete with bears to catch a tasty salmon dinner! Luckily, there was enough salmon for everyone! Here are some videos Mr. Yollis took on his trip. Here is a video full of fun facts about grizzly bears! Did you know that grizzly bears love water! Below is one looking under the water for salmon! 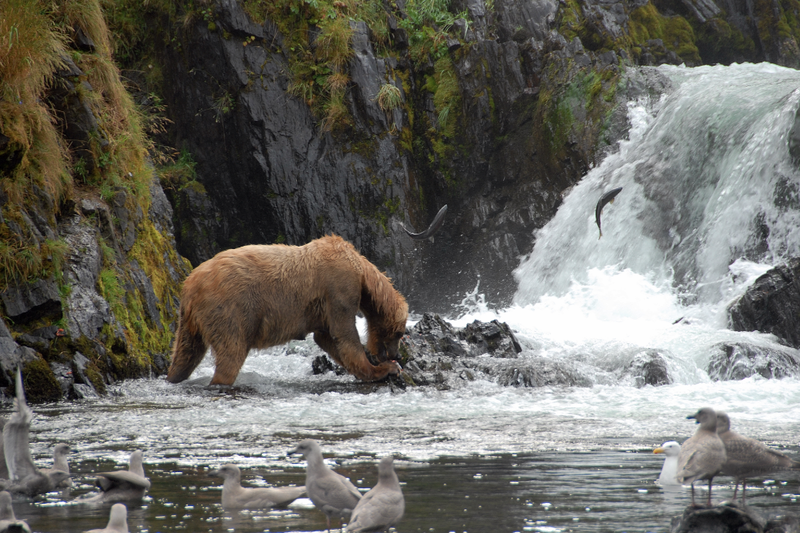 Here is a video clip of a grizzly fishing for salmon at the bottom of a waterfall. Will he catch a salmon? Below is a video clip of One Ear playing with her three cubs! Would you enjoy a float plane ride to the wilderness? Try to write a sentence in your comment that starts with a dependent clause. After, Before, Since, While, When, If, During. which is a sentence that can stand alone! These are such amazing photos and videos! Thank you so much for sharing. The kids are so lucky! Kelly tells me, that Mr. Yollis is very brave and once scared a Grizzly away by throwing rocks ?! I especially enjoyed the mom and her cubs and the bear fisherman video. It's just unbelievable how massive these bears are! Thanks again- I have a new favorite post now! Thank you so much for your kind words about my photos and videos. Kelly is correct, I did throw a few rocks to scare away an overly curious bear. However, I threw the rocks so they splashed right in front of the bear. That's what frightened him...the splashes! Part of the purpose of the post is to allow people to feel like they've had part of the experience of being in Kodiak without actually flying there. I'm glad you enjoyed my visit and can see what is was like to be there in person. I am also amazed how Mr.Yollis managed to scare away that bear. I would be very scared. The bears look cute though too and my favorite video is the mommy bear and her cubs. The cubs are so playful and adorable. Maybe after school is over in June, we can go on a Kodiak Island vacation! If we told Daddy that it's a float plane, he might be be interested! We just don't tell him about the bears. While we are in the wilderness, we can learn how to fish! 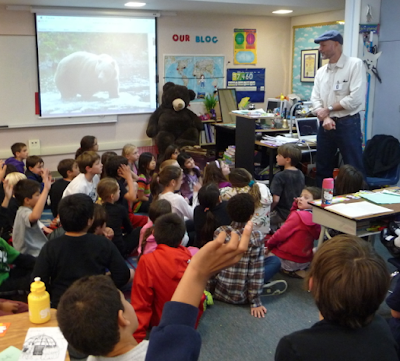 It was surely very enjoyable to have Mr. Yollis in class and I loved his presentation about the Kodiak bears. Wow what a great learning lesson you all had about Grizzly Bears. It got me thinking I really would not like to meet up with a grizzly bear at all for they are so huge. How brave was Mr Yollis scaring off a Grizzly the way he did. Here in Australia we don't have grizzly bears only Koala Bears. And they a quite small compared to the grizzly bears. I too enjoyed watching the mother bear playing with her cubs. Thank you for sharing this post with us all. Glad you enjoyed my pictures and videos. It was great fun shooting them, and it's fantastic to share with other people who appreciate nature. Having seen many nature programs over the years, I find bears to be amazing animals. Australia doesn't have any bears native to the country. They're only found in zoos. Some people call koalas, koala bears because of their appearance but bears are placental mammals and koalas are marsupials, i.e. when the young koala is born as little more than a bean sized creature, it makes its way into the mother's pouch where it develops until large enough to start coming out of the pouch. The closest bears to Australia would be the sun bear of South-east Asia. They can be found as far down as Borneo and Sumatra in Indonesia. Unlike the protected bears of North America, the sun bear is not protected to the same level. Their numbers are declining due to human activity. Now you've seen the magnificence of the bears care of Mr. Yollis and read the book, you can see what a tragedy it would be if bears were no longer with us or only found in zoos. From Henny's comment above, I see Mr. Yollis was brave enough to be able to scare away a grizzly bear by throwing rocks. It seems the bear took the safe option and left. Thank you for sharing your story. I would love to visit Australia someday and see your varied marsupials for myself. They've always been fascinating to me. I was very glad that the bear responded to the splash I caused by throwing a rock at his feet. I wasn't really sure what my next move would have been if he hadn't turned around and walked away. Thanks for your video link! What a wonderful presentation by Mr. Yollis! Beverly had to have been so tickled to be able to learn more about her relatives. Many years ago I lived on the island of Adak in the Aleutian Islands in the Bering Sea. We did not have bears but we did have caribou, eagles, and one sea otter. Amazingly salmon ran every other year. I have traveled to Alaska over a dozen times and am always looking for somewhere new and unique to visit. 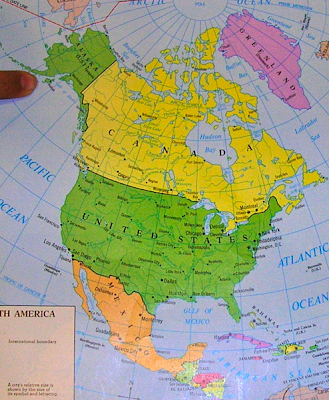 The Bering Sea and the Aleutian Islands always catch my eye on the map. Someday! I think it was a wonderful idea to ask Mr. Yollis to come and share his adventure and wonderful pictures of Alaska. They were awesome! My favorite picture is the one of One Ear, but I also really like the picture of the flower. It's amazing he got that close to the bee. After watching the video of the float plane landing, I think it would be fun to ride in one some day. I was amazed to learn that male grizzly bears can weigh up to 1,400 pounds and females up to 700 pounds! I'm so glad you enjoyed my presentation! The Kodiak bears are truly incredible. In the pictures, sometimes you lose scale and can't fully appreciate how large they would be standing next to a human. They are enormous! I'm glad they were full of salmon! Since I have seen how fun it is to be on that plane, I want to go on a float plane too. It seemed very loud when Mr. Yollis was taking that video. If that bear weighed even less than 700- 1,400 pounds, it could break my table! That's a lot of information on grizzly bears! We don't have any grizzly bears here in Massachusetts but we definitely have black and brown bears! When I was younger I went on a trip to New Hampshire and there was a bear in the parking lot in the hotel I was staying at! I didn't want to get out of the car! What was your favorite information that you learned about grizzlies? Have any of you ever seen one in the wild before? Thanks for sharing so much wonderful information! Thanks for your wonderful comment. We don't have grizzly bears in California anymore, except on the California flag! Bears of any kind can be intimidating, that's for sure! Those grizzly bears are huge! I can not believe you went to Kodiak Island to see those grizzly bears. Was it scary to get close to them? I loved how you presented the information about the grizzly bears to my class. Was it scary to get up in front of everyone and talk? My favorite picture was the close up of the grizzly bear. It is my favorite because it shows you how a grizzly bear really looks up close. My guess is that a grizzly bear's height is 8 to 9 feet tall. How tall do you think a grizzly bear can be? Since you taught me some things about grizzly bears, I would like to learn more about them. I'm glad you enjoyed my talk with the class. I felt very comfortable in Mrs. Yollis' classroom because all of you were so well behaved and asked such thoughtful questions! Thank you! Yes, I was a little bit scared to be so close to the bears. However, I followed all of the advice of the Fish and Game representatives. They are familiar with the animals in that area. They told me where to stand, how to behave, how close to get, and I followed all of their instructions. The grizzly bears I saw looked to be about feet tall if they were standing. Good luck with your research! If would be on a float plane, and when I would be on one I would have fun. Mr.Yollis, what was it like to be on a float plane? I learned a lot of facts about grizzly bears, like sows (female grizzly bears) original wheight is 500 - 700 and boars (male grizzly bears) 700 - 1400 pounds. The bears were so cool. When Mr. Yollis came in and brought all of the pictures I was so excited! Mr. Yollis is a nice man. As bears and their cubs are so interesting, I loved learning about them. I'm glad you enjoyed my presentation! 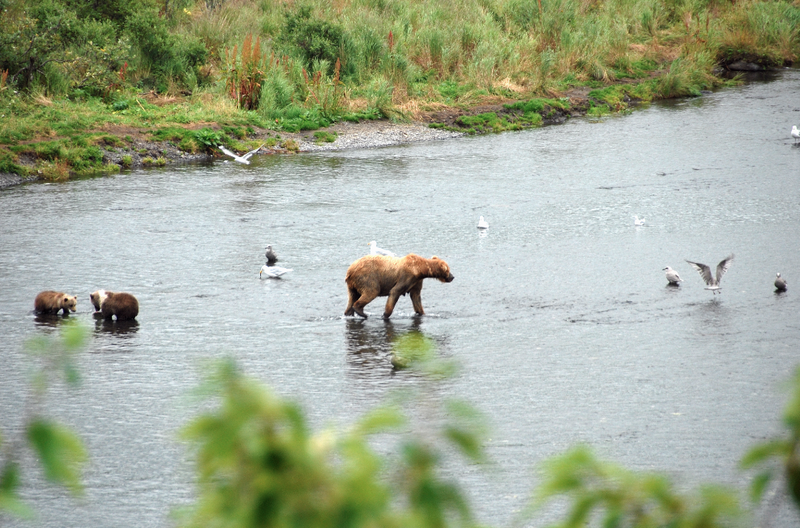 I read a lot about Kodiak bears before I got to the island, so it was quite exciting to see them in person! Reliving the trip with all of you was great fun for me too! I loved the video you took of One Ear and her cubs playing. My favorite part was when the smallest cub fell in the hole and flipped over on his back. After the bear flipped in the hole, he ran to his brothers and mom. The cubs remind me of my dog Jasper because they run like each other. The fish catching video was very funny. I liked it because he was waiting for the best fish. I would really like to go to Alaska some day and see bears too. You are a beary funny commenter! Ha Ha! I'm glad you enjoyed my photos and videos. It was beary amusing when the little cub fell in the hole. I was surprised how long it took him to recover. I hope you do go to Alaska someday. It is a beautiful state! I really like the videos and the pictures you took of your trip to Alaska. I especially like the funny video of the bear trying to catch his dinner, but I also like the video of the bear with the one ear and her cubs. It remindes me of when I see a car with stickers that are meant to represent their family. They are usually in order of height, just like the bears were. I liked the other video also because it was funny that the birds were just hanging there waiting for the scraps (I can't belive they weren't afraid of the bear and the bear didn't go after them). Thank you for your terrific comment! The behavior of the bear catching his dinner was interesting to me as well. It seems that the successful bears catch so much food that they can afford to be picky about their next fish. As long as the river is filled with salmon, the bears only pay attention to fish. It is easier to catch a salmon than chase after a bird. After a while, the birds seem to know that. What a wonderful post! 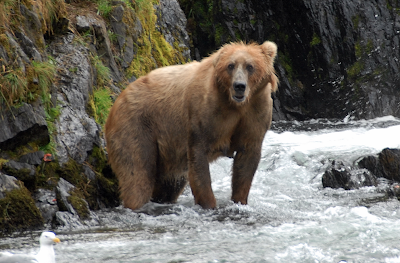 I learned that Kodiak bears are the largest grizzly bears, and they love to eat salmon. I also learned that salmon can go up a waterfall! After watching your videos. I am inspired to fly to Kodiak Island on a seaplane. I hope I get to see One Ear and her three cubs! Like you, I'll have to bring sleeping bags, food, water, and hiking gear. While I'm there, I would like to go hiking, fishing, and bird hunting. I hope you can travel to Kodiak Island again. Thanks for your thoughtful comment about my presentation. 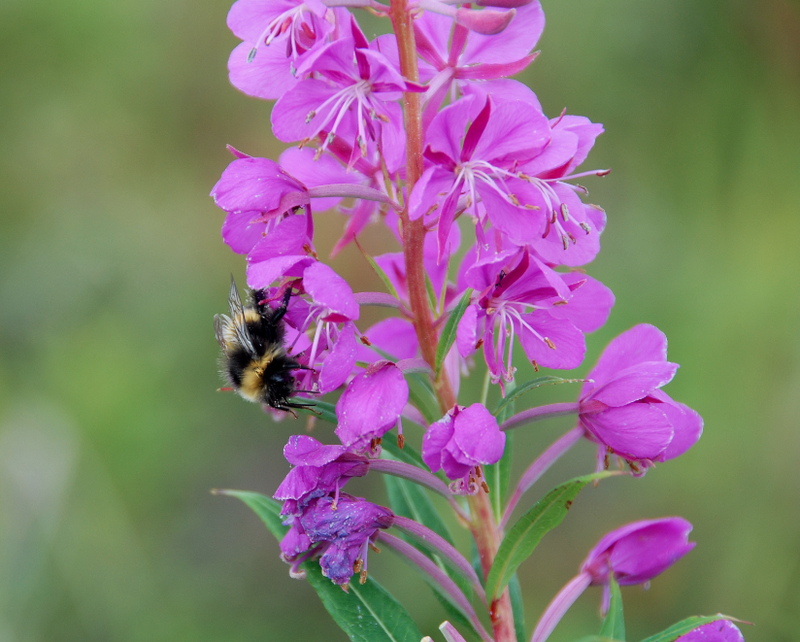 I have always enjoyed observing nature and being in the wilderness. Alaska is one of my favorite places for outdoor adventure. I hope you make it to Alaska to see it for yourself one day! I really enjoyed watching the videos about the bears. My favorite video was the video when one of the bears was missing one ear, and the one where the mother was chasing the cub. I learned that a female bear can weigh from 500 to 700 pounds, and a male can weigh from 700 to 1,400. That is the weight of all the kids in our class combined! I don't really want to go to Alaska because it is too cold for me. How cold was the water? Did you catch any fish? What a terrific comment! I like how you were comparing the weight of a Kodiak bear to the total weight of the class. Well done! You asked about the water temperature. It really wasn't that bad. With proper gear and carefully layering of clothes, I stayed nice and warm throughout the day. Yes, I caught many fish. The salmon are everywhere, but mixed in are some beautiful trout. My favorite trout to catch was the rainbow trout. It is has a beautifully colored body and is fun to catch. Although I caught numerous fish, I usually only kept one to eat for dinner. The rest went right back in the river. Mostly I enjoy fly fishing and shooting pictures to remember my trip. Last year on our spring break trip to Arizona, my family and me went to Bearizona. It is a wild animal park where you drive your car through open forest areas to see different animals like mountain goats, bison, and grizzly bears. We saw several bear cubs that were 3 months old. They are separated from the rest of the bears until they are at least 3 years old and can take care of themselves. I really enjoyed it and hope to go back soon! I like when the bears were going to go fishing and the bears was looking for the Salmon and waiting for it and then he or she finally got it. It was very exciting being with the Kodiak grizzlies in Alaska! I shot the video of the bear at the falls from a distance of about 30 feet. The fish and game representative that I spoke to recognized the bear at the falls from years prior. He told me that I would be okay at that distance. I really relied on the fish and game people and their expertise. Without that advice, I would have stayed much farther back! You asked if the bears were friendly or frenzied. The bears were focused on fishing and were very uninterested in me. I liked that! Thanks for a terrific comment! Did you know the grizzly bears have the longest claws in the world. I love kodiak grizzly bears. Your fact gave me cause to pause! I did not know that they had the longest claws. I know that Kodiak bears are the largest subspecies of brown bears, but I did not know about their claws. If you look at the photographs, you can see that they would be deadly! I really like the Grizzly bear video. My favorite part was when the 2 Grizzly bears were rolling around and around. I also like when the big bear was catching the fish. I really enjoyed watching the young cubs play, too. You can see how it helps strengthen their bodies. They must have played for about twenty minutes before their mother led them back to the river to continue fishing. I'm glad you enjoyed my videos! I'm glad you enjoyed my presentation, and thank you for the bear facts! I love learning, especially about bears. The bears that I saw were eating constantly in order to prepare for their hibernation. Their deep sleep can last for months, so they must put on as much weight as possible. Can you imagine going to sleep and not waking up for months? What an adaptation! Do you know why bears hibernate? Hi! Our names are Bella and Grace from Mrs. Ranney's class. We had a great time learning about Kodiak Bears. Thank you, Mr. Yollis. Kodiak bears are meat eaters. When Kodiak Bears stand up, they can be as tall as 10 feet. All bears have small eyes, and have trouble seeing. We hope you enjoyed some of the facts we shared with you. You are correct, bears are meat eaters. However, they also eat plants like grass and berries. Do you know what you call an animal that eats meat and plants? Bears have a keen sense of smell! I'm glad they were only interested in fish while I was there! Did you know that the female Grizzly Bear weighs 240-400 pounds? When the female Grizzly Bear stands, it is about 6 to 8 feet tall. insects,roots,and land animals. Did you also know that in the summer and fall they can eat up to 90 pounds of food? Kodiak bears, which are a subspecies of grizzly bears, are the largest grizzlies. The female Kodiak weighs approximately 500-700 pounds. That's a lot of weight! Yes, I knew that they ate a lot of food. They need to pack on lots of pounds in order to survive their winter hibernation. Do you know why bears hibernate and for how long? My favorite picture is the mom with her cubs. I love the one you called One Ear with her cubs. I enjoyed watching One Ear and her cubs as well. They were a fun family to observe. I was fascinated with how gentle One Ear was with her cubs. They were so small compared to her, and she treated them with such love and tenderness. You asked which is my favorite picture. My favorite is the close up picture of a large male fishing in the river. Whenever I look at that picture, I remember how excited I was to be in the same stream fishing with him! What an experience! Those videos are so cute! I am Jenna's brother Ty. I am 7 years old and I am in Mrs. Levy's class. I am in first grade. We have a blog too. You should come visit. I would like to go on a float plane ride to the wilderness one day since I'm not afraid of heights and I'm not afraid of deep water either. I learned that grizzly bears love to fish, that the cubs are so playful, and that they are the biggest bears in the world. If I were a fish, I would NOT want to be grabbed or eaten by a grizzly bear. Would you? My name is Hayden. I am Jenna's brother. I am 4 years old. This is my first comment! Jenna helped me type it. I think the cubs are so cute! I liked the videos. I thought that it was funny that the salmon climb a ladder. I would like to go on a float plane but I hope I would not get sick. Did you catch a lot of salmon? Or, did the bears get it all? WOW! Those grizzlies are tough! The picture of the grizzly bear catching a salmon is a spectacular action shot! Those are big grizzlies! They must be good at fishing. Do you think that's their talent?